I’ve been using Boomerang for Gmail for a year or two now and love it. It’s a FREE add-on to Gmail that allows you to send emails to yourself, or anyone, in the future! The main purpose I use it for is reminding myself of an event in the future. Months ahead of time, quarterly, tomorrow… whatever. A lot of my bill payments or business payments are all paperless these days and in some cases I’ve totally opted out of even getting a reminder that anything is due. With Boomerang I simply send an email to myself “so-and-so is due this week” and click SEND LATER and select when the reminder needs to arrive in my inbox. Done! I’m sure you can easily think of your own reasons for wanting to send emails in the future so I won’t list the other ways I use their service. Boomerang’s own video gives an example of sending an email to a client Monday morning as opposed to the previous Friday evening and then having that email buried in all the weekend email come Monday morning. The other major advantage of using Boomerang is that you can also choose to receive a “follow-up email” from the Boomerang service if you haven’t had a reply to your email within a certain time period. I rarely use this service, but it may be for you. 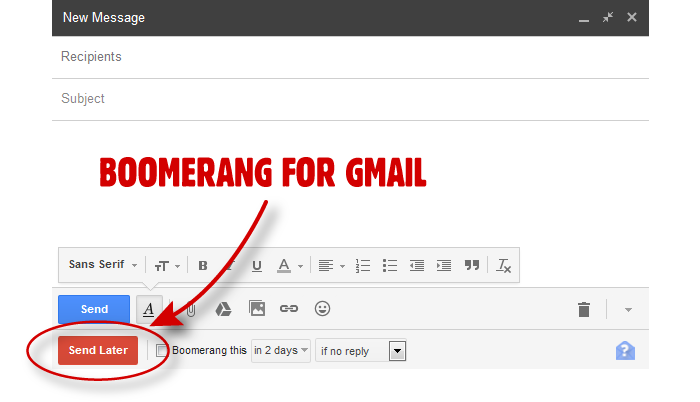 Read more about Boomerang for Gmail at their website.